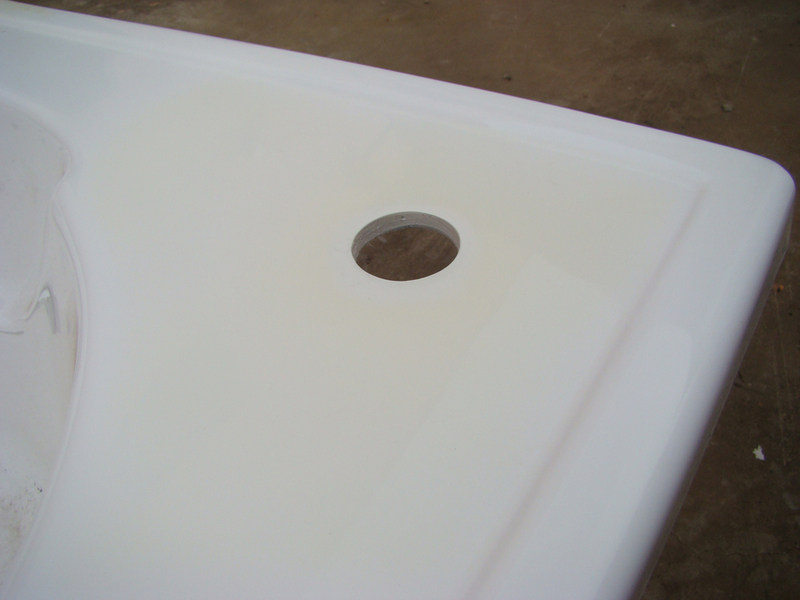 We are having problems with the MMA system products we recently purchased for repairing our acrylic bathtubs. See photos. The white basecoat is becoming yellow after we apply it. 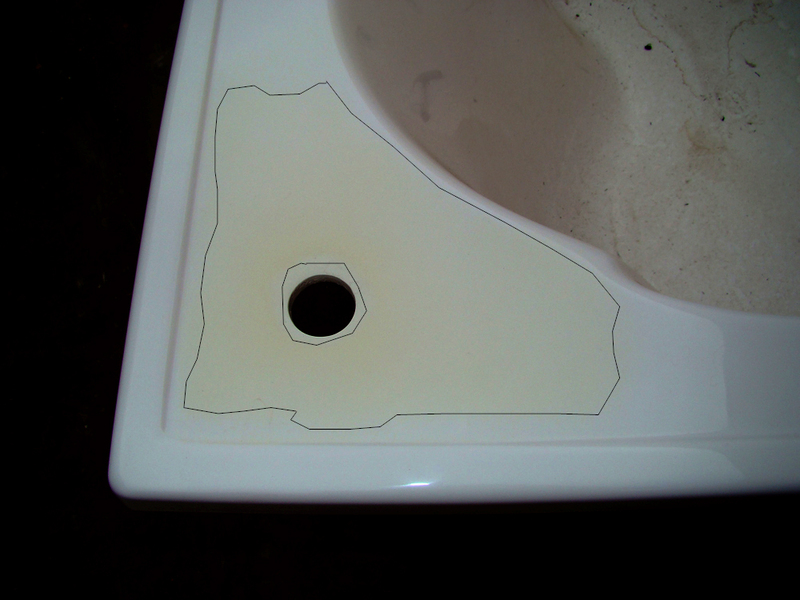 After we fix the defect and refinish it in our plant, the repaired area of the bathtub becomes yellow. We have many difficulties with it. We’d like to know why this is happening. The most common cause of MMA basecoat yellowing is the absence of the protective clear topcoat. It is either that it was not used at all, or it was accidentally removed by sanding and buffing excessively. It is imperative that all repairs have the clear coat designated for that repair system. The MMA system basecoats will yield a good initial repair without clear coat. However, overtime, yellowing and discoloring can occur under the right conditions. It appears that the unit in your picture had not been sold and installed. If it has been stored outside, and exposed to sunlight and weather, the basecoat will turn yellowish due to the effects of this exposure. Even indoors, soaps, cleaners, shampoos, hard water, dirt and UV will yellow the base coat that has not been clear coated. The MMA System must be used with the MMA clear topcoat. It should be thinned only with the MMA Monomer to be effective. A factory can experience excellent long term repairs on bathware using the MMA System complete with Clear Coat. I would recommend getting this information to your production and QC department so they can incorporate the clear coat into the process. The Quick Glaze and Granite Repair Systems must be clear coated with the K2000 Clear Coat. Professional repair contractors should be equally diligent in always using the appropriate clear topcoat to avoid call back complaints. Please let me know if this resolves the issue or if you experience any other performance issues with our systems. Thank you for asking the question about yellowing. Danilo, just in case that there might be another problem source, I have included the following information that has been known to cause yellowing and other issues in an MMA system repair. It for sure will be helpful in your quality control procedures. It is typical for factory air source lines to carry a high concentration of oil and moisture. 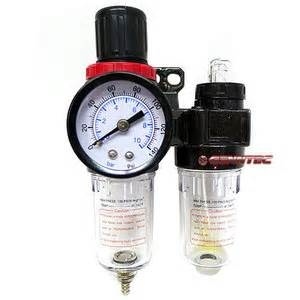 The compressor itself can be a moisture producing machine. Even small portable compressors produce heat, that in return generate moisture in the lines. This is especially true in high humidity regions. With water present, the lines and tank reservoirs can also rust, carrying oxidation through the lines to the airbrush or spray gun onto the repair. Oil by nature can create a amber color to it however, oil typically will cause fisheye and effect smooth flow out of the spray coating. Water traps simply do not work efficiently. This picture shows a common type water trap, which our experience shows are ineffective in eliminating all liquids from the compressed air. Regardless of the size or quality of the device, it will retain a portion of the water, but not 100%. An industrial grade desiccant filter tower works best. This product is recommended, and can be installed at the air supply source to serve the repair area in manufacturing plants. The following picture shows an in-line desiccant air filter for portable use and where little moisture is present in the lines. MTP sells these units for use by repair professionals. With the air lines drained of moisture, a desiccant air filter stops moisture and oil from going through to the repair surface. This filter will also prevent fisheyes from occurring in the repair surface during the spraying process. It is highly unlikely to receive new product from MTP with contamination. Contamination usually happens when multiple technicians handle the same product in the factory or in the field. This can happen where two or three shifts occur in a factory. Contamination can occur from alternative products being substituted for MTP products for solvents, reducers, thinners, hardeners and toners. To assure trouble-free results, use only MTP brand components to assure compatibility and quality consistency. Do not re-use or mix old, used product for multiple applications. This can be especially unforgiving when multiple technicians are using the same product or mixtures from one shift to the next production shift. The MMA product, both basecoat and the topcoat, are mixed with thinners and air dry on the sprayed surface. Therefore, a prepared mixture may last for days before solidifying when stored. But it can lead to over thinning or contamination when left on the shelf or mixed in the pot. For example, multiple temperature thinners added to the product can have an adverse effect on the performance of the product. The absolute best practice is to prepare fresh materials using proper components each time a repair job is initiated. Check for contamination, yellowing or amber tones in the product source before mixing.